German 1st SG battlecruisers and 2nd SG light cruisers escorted by destroyers sailed to attack the Yorkshire coast. 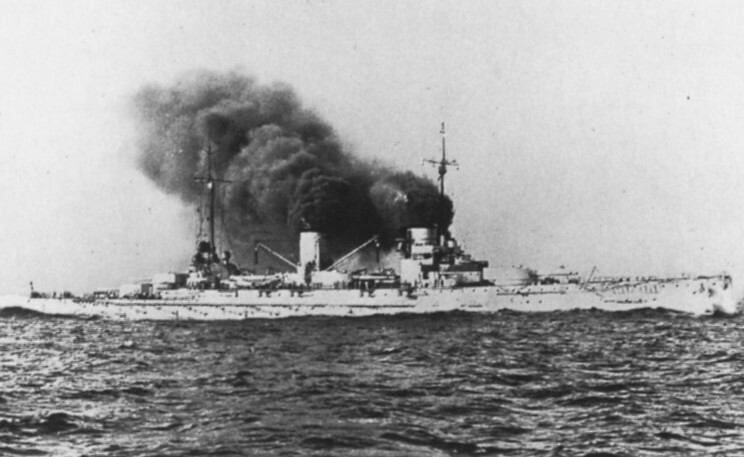 Battlecruisers Seydlitz, Moltke and armoured cruiser Blücher were to bombard Hartlepool, battlecruisers Derfflinger and Von der Tann to bombard Scarborough then Whitby, and light cruiser Kolberg to lay up to 100 mines off Flamborough Head. Both the German and British battlefleets were out in support of their forces. Coming south in anticipation of this attack the seven 4th DF destroyers screening Adm Beatty's battlecruisers - Lynx, Ambuscade, Unity, Hardy of 1st Div and Shark (above), Acasta, Spitfire of 2nd Div, met destroyers from the German light cruiser screen in the Dogger Bank area, in c54.10N, 03.00E at 0515. When challenged, they opened fire damaging Lynx and Ambuscade, the remaining destroyers then sighted cruiser Hamburg close by at 0553. This time Hardy and Shark opened fire and it was Hardy's turn to be damaged. Two merchantmen were damaged and two fishing vessels sunk in the docks during the Hartlepool bombardment. Three German ships appeared off the defenceless town of Scarborough just before 0800, battlecruisers Derfflinger and Von der Tann opened fire, while light cruiser Kolberg went to lay mines off Flamborough Head. The two battlecruisers then headed north for Whitby, and opened fire on this equally defenceless port just after 0900, departing after 10min and ignoring two tramp steamers passing to the south. Four fishing vessels were damaged in Scarborough during the bombardment. Although the retreating German ships were sighted by ships of the Grand Fleet's 1st LCS and 2nd BS in the low visibility, they could not be brought to action. The following Memorandum has been furnished by the Admiral Commanding the East Coast Minesweepers, detailing the recent mine-sweeping operations off Scarborough. 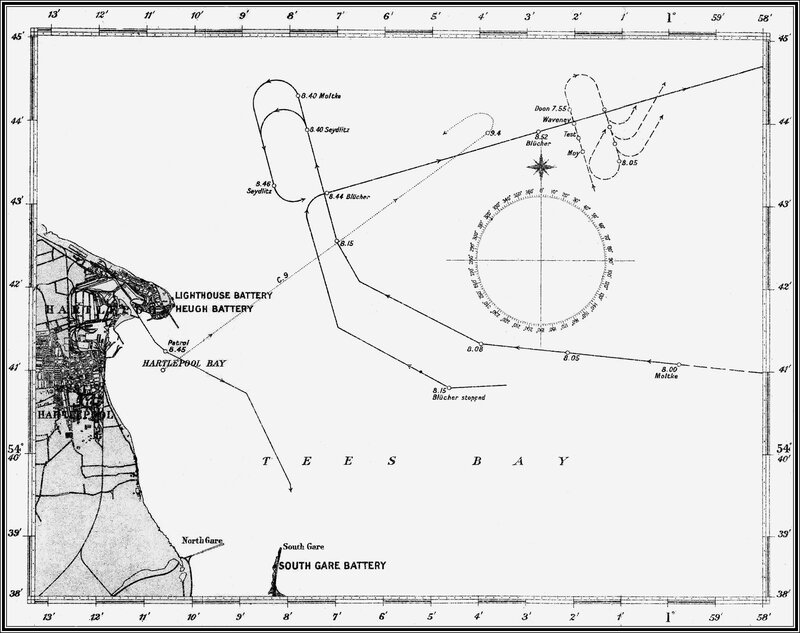 From the 19th to the 31st December sweeping operations were conducted by the East Coast Mine sweepers with the object of clearing the minefield which had been laid by the enemy off Scarborough. 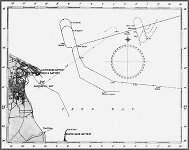 At the beginning there was no indication of the position of the mines, although owing to losses of passing merchant ships it was known that a minefield had been laid. Commander Richard H Walters, R N, A M S Staff, was in charge of the whole of the mine sweeping operations from 19th to 31st December. During this period a large number of mines were swept up and destroyed. By the 25th December, a channel had been cleared, and traffic was able to pass through by daylight. Lieutenant Godfrey Craih Parsons, R N , HMS "Pekin," displayed, great skill and devotion to duty in continuing to command his group of trawlers after having been mined in Trawler No 58 on 19th December. On this day his group exploded eight mines, and brought to the surface six more, Trawler No 99 being blown up and Nos 58 and 465 damaged, all in the space of about 10 minutes. Lieutenant H Boothby, R N R, HMS "Pekin". When Trawler No 99 ("Orianda") in which he was serving was blown up by a mine on the 19th December, Lieutenant Boothby successfully got all his crew (except one who was killed) into safety. Lieutenant Boothby was again blown up on 6th January, 1915, in Trawler No 450 ("The Banyers"). Lieutenant C. V. Crossley, R.N.R., H.M.S. "Pekin". Whilst sweeping on 19th December, three violent explosions occurred close under the stern of his ship, Trawler No. 465 (“Star of Britain”). He controlled the crew, and himself crawled into a confined space near the screw shaft, discovered the damage, and temporarily stopped the leak sufficiently to enable the pumps to keep the water down and save the ship. Skipper T. Trendall, R.N.T.R., Trawler "Solon," No.55, on his own responsibility went to the assistance of the Steamer "Gallier," which had just been mined on the night of 25th December. It was low water at the time and dark, and the "Gallier" was showing no lights, so had to be searched for in the mine field. Skipper Ernest V. Snowline, R.N.T.R., Drifter "Hilda and Ernest," No. 201, carried out his duties as Commodore of the Flotilla of Lowestoft drifters under Chief Gunner Franklin, R.N., in a most satisfactory manner. He kept to his station in heavy weather, standing by the S.S. "Gallier" after she had been damaged by a mine. Lieutenant W. G. Wood, R.N.R., Trawler "Restrivo," No. 48, did excellent work in going to the assistance of damaged trawlers on 19th December, and performed the risky duty of crossing the mine field at low water when sent to bring in the "Valiant," which had been disabled by a mine. Skipper George W. Thornton, R.N.T.R., Trawler "Passing," No. 58, displayed great coolness and rendered valuable assistance to Lieutenant Parsons in controlling the crew when No. 58 had been mined. Skipper William Allerton, R.N.T.R., Drifter "Eager," No. 202, kept to his station in heavy weather, standing by the S.S. "Gallier" after she had been damaged by a mine. Sub-Lieutenant W. L. Scott, R.N.R., Drifter "Principal," went alongside the Trawler "Garmo" in a dinghy to rescue a man at considerable risk to himself and his boat, as the vessel was floating nearly vertical at the time, with only the forecastle above water. She turned completely over and sank a few minutes after he left her. Skipper Thomas B. Belton, R.N.T.R., Drifter "Retriever," No. 223, kept to his station, marking the safe channel for shipping when all other drifters were driven in by the weather. Robert A. Gray, Engineman, R.N.R. No. 694ES, M.S.Tr. No. 465. William A. Lewis, P.O., 1cl., O.N. 178498,. M.S.Tr. No. 450. Christopher Briggs, Engineman, R.N.R. No. 1542ES, M.S.Tr. No. 450. William Gladding, Cook, R.N.R. No.223T.C., M.S.Tr. No. 450. Robert Frost, Second Hand, R.N.R. No.81D.A., M.S.Tr. No. 43. Edwin F. Frankland, Deck Hand, R.N.R. No. 2481D.A.,.M.S.Tr. No. 49. George Newman, Engineman, R.N.R, No. 625ES, M.S.Tr.No.451. William R. Kemp, Engineman, R.N.R. No. 846ES, M.S.Tr. No. 49. RANDELL, Frederick, Boatman (Coast Guard), 301408 (Po), kill in raid. Lieutenant C. V. Crossley, R.N.R. Skipper Ernest V. Snowline, R.N.T.R. Robert A. Gray, Engineman, R.N.R., No. 694ES. William A. Lewis, Petty Officer, 1st Class, O.N.178498. Christopher Briggs, Engineman, R.N.R., No. 1542ES. William Gladding, Cook, R.N.R., No. 223TC. Robert Frost, Second Hand, R.N.R., No. 81DA. John Walter Johnson, Signalman, O.N. J 6110, H.M.S. "Hardy." Captain Lionel George Preston, R.N. Commander (Acting Captain) Richard Huth Walters, R.N. Lieutenant Godfrey Craik Parsons, R.N. In recognition of his consistently gallant behaviour, whilst engaged in mine-sweeping operations, and particularly on the 4th September, 1915, when, the vessel in which he was serving having struck a mine and Lieutenant Parsons himself having been crippled by severe wounds, he nevertheless crawled from the bridge to the boat-deck to obtain assistance for another Officer who was lying unconscious on the bridge.